U.S. pizza giant Papa John's is apologizing and has fired one of its New York City employees after he or she used a racial slur to describe a customer on the receipt. When Minhee Cho, a 24-year-old Korean American, received the receipt for her in-store order her name was listed as "lady chinky eyes." 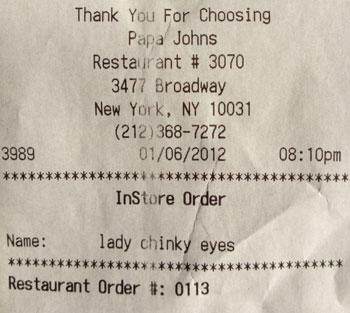 Cho posted the picture of the receipt to Twitter writing, "Hey @PapaJohns just FYI my name isn't "lady chinky eyes." In reaction to the post, so many people called Papa John's asking for Chinese food that it affected their business. "That's poor management. It was surprising to see that on paper; if they had said it in person, it would have been worse," she said to the New York Post. "I probably would not go there again, because they would probably spit in my food." "We were extremely concerned to learn of the receipt issue in New York," reads a post on Papa John's Facebook page. "This act goes against our company values, and we've confirmed with the franchisee that this matter was addressed immediately." However, a manager, who would only identify himself as Jerome, told the Post they use terms like that sometimes to identify people because it is a busy restaurant. He said the cashier meant no harm. Store owner, Ronald Johnson told the New York Daily News he was shocked and was going to send the employee to sensitivity training, but Papa John's is taking a more serious approach. "We are very upset by recent receipt issue in New York & sincerely apologize to our customer," reads a Papa John's tweet. "Franchise employee involved is being terminated." This isn't the first time a cashier at a fast food chain has been fired for writing a racial slur on a receipt. Instead of writing the real name of the real names for the Asian customers at a California Chick-fil-A, the cashier wrote "Ching" and "Chong".